Promesh ANAT T, has high clinical efficiency in inguinal hernias repair. It has preshaped anatomical wall reinforcement. It is best suited for inguinal hernias. High resistance knitted polypropylene on the prosthesis solid matrix. 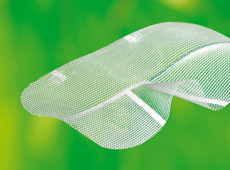 Light, knitted polypropylene structure on sensitive, high-risk areas. Mechanical resistance adapted to the biomechanical properties of the abdominal wall. Vertical insertion through a 10 mm trocar without needing to wind the prosthesis.